Having revolutionized the industry with the original DaVinci and its follow-up, the Ascent, this brand is known for producing portables that are true masterpieces of design. Now the brand is back with their latest innovation - the DaVinci IQ vaporizer, a model unlike anything else on the market today. This innovative unit features Smart Path Technology that will enable you to choose from four different settings and automatic selection of the most exact temperature for your sessions. The ceramic zirconia air path is made out of the finest of materials which produces the best flavor and no weird tastes. With the available Bluetooth App, the DaVinci IQ offers maximum control over anyone's vaporization experience, plus the ability to power it on/off from the app. While many of the convection portable vaporizers have advanced over the years, none up to this point could deliver the on-demand heating and rapid vapor production of a true conduction vape. The DaVinci IQ is designed to treat you to all of the benefits of conduction but with enhanced efficiency. Its 360-degree conduction heating system directly heats your dry herbs from all sides, eliminating the need to stir and ensuring that you get the most out of them. The IQ features a ceramic zirconium oven that maintains vapor purity and is incredibly durable. No other form of ceramic is quite as strong, making this device one of the best vaporizers out there in terms of quality construction. Because of a ceramic zirconium mouthpiece and a silicone gasket, it produces vapor of unparalleled quality. With the DaVinci IQ, you can increase the temperature automatically as you vape to make sure you get the full benefits from your material. The dry herb only model comes with four different Smart Path modes, which are ready for you to customize with the mobile app to get the gradual increase that's right for your type of material. A free mobile app makes using the IQ vaporizer an effortless task. You can set the temperature to the precise level you desire with just a couple of taps on the screen, plus it vibrates when it's ready for use, and its convenient 50-LED light screen allows you to monitor performance. When you need a little extra heat during your session, the DaVinci IQ is ready for action. Just hold down the button to activate Boost Mode, and this beautiful advanced herbal vape will continue to heat up degree by degree until you let go. A powerful replaceable and removable battery is included with the complete kit - offered for sale above. You can even carry spare batteries with you, charged up and ready for use just in case, plus the IQ can run for around 70 minutes on a single charge. Elegant looking, the DaVinci IQ is equipped with 51 built in LED dots which function as a display. Able to show everything you need, this basic design creates no unnecessary parts. Beautiful is the word that sums up the appearance of this super vape. All of the interior parts are protected by a high quality anodized aluminum exterior, adding a futuristic feel. The very first vape units hit the market back in 1990, and if you take a look at the first vaporizer for herbs ever sold, it is a far cry from the sleek, modern DaVinci IQ. Technology in the world of vaporizer design has evolved at a lightning fast pace, and shows no sign of stopping, as the demand continues to rise. So what will the vaporizer of tomorrow be like? You are reading about it. You can count on VaporPlants.com to continue to be your source for the best vaporizers and to keep you up to date on the latest news about new vaporizer designs. There is a major push to keep making portable vaporizers smaller and smaller without diminishing battery life. Over time DaVinci engineers have unveiled lighter, smaller models of their best-selling portable vaporizer units, and you can expect them to continue finding ways to reduce the weight and size of their future models. Conduction heating was the first method of heating up materials in vaporizers. It works quickly by directly heating up herbs; however, it often ends up burning the material. True convection vaporizers, such as the IQ, warm up material by circulating heated air through it's chamber to provide a true vaping experience; however this method requires a lot more power from the battery. The brand's ability to make a battery powerful enough without it being large and bulky has made the DaVinci IQ a true convection vaporizer, ahead of the industry's standards. The main focus was finding the secret to generating the power needed for convection, while still allowing it to provide a satisfying amount of battery life and keeping the size of IQ vape small. Many other vaporizers are capable of reaching needed heat levels safely; however, another problem was that some of the beneficial compounds in dry herbs require more intense heat. Once these goals have been achieved and made more affordable, the DaVinci IQ was released to public. Due to increasing demand for users to be able to set their vaporizers at precise heating levels, so that they can be certain that they're getting the benefits of the specific compounds that they require, this dry herb vaporizer features an LED screen and digital temperature settings, which can be controlled via Bluetooth connectivity from your smartphone and a free App. 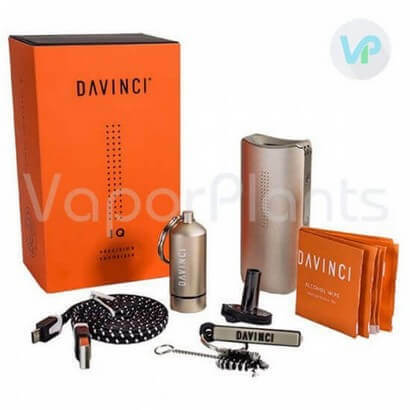 With the innovations from DaVinci team, the best portable vaporizer units which were available yesterday have been replaced by even better model - the DaVinvi IQ Vaporizer. With the DaVinci IQ, you'll receive an adapter that allows you to attach a wide range of glass tools and rigs. Endless vaping possibilities await you with this vaporizer. Once you've seen how well the IQ vaporizer works, you'll want to have it in your collection for years to come. The good news is that you will, since the DaVinci brand warranties the unit for 10 full years, so you can purchase it with confidence that it can stand the test of time. Use VP5 Coupon Code and save 5% at checkout! 1.65" x 3.54" x .94"
One of my favorite vapes - Review by David C.
I love the DaVinci IQ so much that I bought two within the same week. I wanted to be sure that one was always charged so that I could use it any time that I wanted. So far, this is one of my favorite vapes. It might even be my favorite of all time. Looks as smooth as it is to hit - Review by Jeff T.
The DaVinci IQ vaporizer looks as smooth as it is to hit. I love how easy it is to run it and to clean it. The vapor quality is excellent. It does not blow huge clouds, but I prefer that since I like to vape in public a lot. Really easy to clean - Review by Jennifer S.
I am a new vaper but I have tried enough to know this is excellent. It is simple to use and has a nice, long-lasting battery. It is also really easy to clean which is important for me as I prefer very little maintenance. Incredible smoothness - Review by Theodore B.
I had never had a good experience while vaping before I tried the DaVinci IQ. I have been smoking for 15 years and was wary about making the switch, but I am so glad I did. This vaporizer offers incredible smoothness and is so simple to use. I'll never go back to smoking after this. Best portable vaporizer - Review by Irene M.
Everything that I have ever wanted in a vaporizer I have found in the DaVinci IQ. It is hands down the best portable vape I have ever used. Needs practice to master - Review by Smokes K.
The DaVinci IQ comes with a bit of a learning curve for learning to use it the right way, but it is worth spending the time to get to know it. Perfect for on the go - Review by Judy P.
It's really portable and discreet, perfect for on the go vaping. Simple to use - Review by Shannon D.
I got this as my very first vaporizer and I have to say I couldn't be happier. It was simple to use from the moment I opened it, and it is even easier to maintain and to clean. Hits well - Review by Michael H.
The DaVinci IQ definitely ranks up there with one of the best vaporizers I have ever used. I love the DaVinci vaporizer so much that I have recommended it to all of my friends. It hits well, I think, but the best part is the battery life and the flavor. 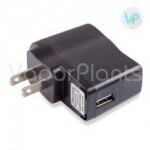 Best for Herbs - Review by Lois N.
It is easier to keep clean than any other vaporizer I have used. The IQ vaporizer is really the best: great, long lasting battery, simple to clean, excellent flavor. It has a small vapor output, but that's just fine since I prefer to vape it in public, personally. Really simple to use - Review by Richard R.
The DaVinci IQ is a great pen. 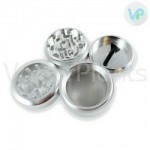 It is really simple to use, is super small and produces great tasting vapor. I love how easy it is to control the vaporizer using the app or doing it manually. It has a lot of accessories and a swappable battery, which is great. It does get really hot when I use it at a high temperature for a long time but I suppose that is to be expected. The battery compartment can be a little tricky to close but overall it operates nicely, gets hot fast and has great flavor. I love it - Review by Tamatha J.
I have used a number of different battery-powered vapes including the Crafty, but the DaVinci IQ outperforms even that. It is without a doubt the best vape that I have used to date. I even gave some of my other vapes away. It is really easy to use and to clean and it produces huge clouds. Best one by far - Review by Charles R.
I have owned a lot of different vapes before and I have got to say that this is the best one by far. It is really nice and small and it does the job well. The app is really nice for vaping at certain degrees and getting the right kind of vape that I want from each session. The mouthpiece is also really great at cooling the vapor and it does not burn my lips. Really great flavor - Review by Janice A.
I love how discreet the DaVinci IQ is. This vape is much better than the other vapes I have tried. It has a really great flavor to it and a really low aroma that makes it perfect for vaping on the go. Very happy - Review by Johnny K.
The reason I bought the DaVinci IQ is because I heard it eliminates a lot of the odor that other vapes often give off. I am happy to report that the rumors are true. I can't smell anything but I can taste everything. It has a really gorgeous design, too. Great App - Review by Anne J. The DaVinci IQ is so high tech. I love how easy it is to use and the app makes it even easier. I think it's a lot of fun to program the temperature that I want to use. The only thing is, I wish the original battery lasted longer. Battery is excellent - Review by Jean B. Having a vape that lets me change the battery is excellent. This small vape is powerful and robust. The flavor and clouds are great. DaVinci IQ is awesome - Review by Angel R.
Everything about the DaVinci IQ is awesome except the battery life on the stock battery is not long. But since I can change the replaceable battery that is not a problem. Great taste - Review by Michael H.
The DaVinci IQ gives great taste, pretty much no smell and is easy to hide in my hand. I recommend it to everyone. Small and discreet - Review by Tiffany R.
I have had a lot of vapes and this is the best one by far. It is small and discreet and does exactly what it is supposed to. The battery options are nice as well. Big clouds - Review by Wayne S.
I take the DaVinci IQ with me anywhere and no one knows what I'm doing. It doesn't stink but it does give off big clouds depending on the setting. Great battery life - Review by Susan M.
This vaporizer has a great battery life and being able to switch out different batteries is great for ensuring my DaVinci IQ always has a charge and is ready to go. Compact and powerful - Review by Michael C.
This vaporizer is so simple to use on its own and the app makes it even easier. I love that it is so portable and fits in my pocket and that even with its small size it is able to pack a punch as powerful as it is. New favorite - Review by Virginia C.
I have used many different vaporizers in my day, and I must say that the DaVinci IQ is my new favorite. Hits like a desktop - Review by Rhonda R.
The flavor I want, I get with the DaVinci IQ. It is even comparable to my volcano vaporizer, which I never thought I would be able to say about any of my vapes. Simple to maintain - Review by Christine M.
I like that IQ has such an easy path for loading it up. It makes it so I can vape whenever I want to do so without having to spend too much time on it. It is really easy to clean so maintaining it is not an issue at all. Cool vapor - Review by Theodora P.
The mouthpiece is one of the best parts, which I never thought I would say that about a vaporizer; it helps to cool the smoke on the way to my mouth so that it does not feel as if it is scorching my mouth and throat. Great app - Review by Alison D.
I love that there is an app that lets me control the DaVinci IQ so that I can get my smoking sessions fine tuned the way that I want them to be. Favorite portable vaporizer - Review by Emma B. This is my second favorite vaporizer that I have ever bought, after my desktop vape that is not portable. Simple to clean - Review by Julie J. It is super easy to clean and it gives me big clouds when I want them. When I don't, I can take smaller draws and get less vapor which is ideal for vaping in public. Best vape - Review by Tammy C.
The DaVinci IQ is without a doubt the best vape that I have every used. I even gave one of my other vaporizers away because I knew that I would never want to use another one after trying this out. High end vaporizer - Review by Carolyn J.
I have used a number of different vaporizers including a lot of really high end ones, and I have to say that this one outshines them all. Lots of accessories - Review by Frederick B.
DaVinci IQ comes with more accessories than I know what to do with. I also like that the IQ vape comes with a swappable battery. The only complaint that I have is that it gets really hot to the touch when it is used at a high temperature for too long. Phone app - Review by Eileen G.
I like that there is an app that I can use to control the unit. Quality vaporizer - Review by Susan J.
I like that the IQ vaporizer provides even vapor through and through without my having to worry about the battery power draining and affecting the quality of the vapor. Top best vaporizers - Review by James J. The DaVinci IQ is an all around great vaporizer. The best vape - Review by Weed W.
The DaVinci IQ is one of the best vapes I have ever purchased, I've owned overall 3 portable vaporizers. The DaVinci IQ is a lot better than I imagined, it’s the best I have experienced. Overall, this is a quality product that does what it is made for and performs right out of the box. Perfect weight for me individually - quality product that is good for everyday use.